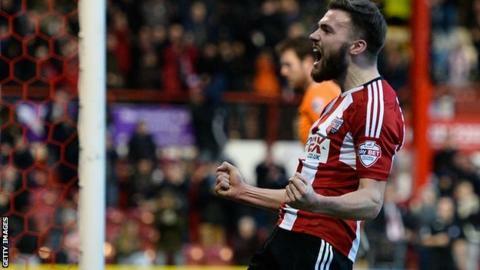 Stuart Dallas scored the winner as Brentford ended a three-game losing streak with a victory over Rotherham. Both sides had chances in a quiet first half, but Richard Smallwood miscued for the visitors and Alex Pritchard twice went close for the hosts. Dallas gave the Bees the lead with a volley from the edge of the area. Conor Newton and debutant Adam Hammill both forced saves from home keeper David Button before Pritchard hit the post for Brentford. Victory for Mark Warburton's side meant they remained in fifth place, while Rotherham dropped to 20th and are only three points clear of the relegation zone. The Millers have now won just one of their last 14 games in all competitions, but they could have taken an early lead when loan signing Danny Ward went close in the opening 15 minutes. Smallwood then wasted a better chance when he was played clean through, only to completely fail to make contact with the ball, before Pritchard threatened with a chip for Brentford and then a free-kick that went just wide. Dallas scored what proved to be the winner when the ball broke to him on the edge of the area and he confidently found the net. Newton and Hammill forced saves from Button before Andre Gray danced through only to shoot straight at Millers keeper Adam Collin, who then did well to tip Jota's rebound wide. Pritchard hammered a 25-yard effort against the woodwork and Jonathan Douglas saw a goalbound effort scrambled off the line by Kari Arnason as Brentford saw the game out in positive style. "In the end it was a good victory and a clean sheet. The result was important after three defeats, but we have played better against Wolves and Brighton and lost. "We started very slowly which is unlike us. There was no tempo, no intensity and we looked subdued, but after half-time we looked like a different team." "We know that a striker is a priority and we are scouring the country, but it's difficult because clubs in this division have millions to spend and we have three bob. "We should really have been out of sight by the break, but once again we've dominated and not got what we deserved. In recent weeks we've done the same and drawn, but today they have nicked it with a decent goal." Match ends, Brentford 1, Rotherham United 0. Second Half ends, Brentford 1, Rotherham United 0. Offside, Brentford. Jon-Miquel Toral tries a through ball, but Jake Bidwell is caught offside. Attempt saved. Jonathan Douglas (Brentford) right footed shot from the right side of the box is saved in the bottom left corner. Assisted by Jon-Miquel Toral. Attempt saved. Paul Green (Rotherham United) header from the centre of the box is saved in the top left corner. Assisted by Scott Wootton with a cross. Foul by Scott Wootton (Rotherham United). Attempt blocked. Adam Hammill (Rotherham United) right footed shot from the left side of the box is blocked. Assisted by Jordan Bowery. Offside, Rotherham United. Frazer Richardson tries a through ball, but Conor Newton is caught offside. Attempt missed. Conor Newton (Rotherham United) right footed shot from outside the box is close, but misses to the right. Adam Hammill (Rotherham United) wins a free kick on the left wing. Corner, Brentford. Conceded by Scott Wootton. Offside, Brentford. James Tarkowski tries a through ball, but Andre Gray is caught offside. Corner, Brentford. Conceded by Frazer Richardson. Substitution, Rotherham United. Frazer Richardson replaces Reece James. Attempt blocked. Danny Ward (Rotherham United) left footed shot from outside the box is blocked. Assisted by Matt Derbyshire. Alex Pritchard (Brentford) hits the left post with a right footed shot from outside the box. Assisted by Jonathan Douglas. Attempt missed. Matt Derbyshire (Rotherham United) right footed shot from outside the box is too high. Assisted by Danny Ward. Attempt missed. Jonathan Douglas (Brentford) right footed shot from the centre of the box misses to the right. Offside, Brentford. Alex Pritchard tries a through ball, but Andre Gray is caught offside. Attempt saved. Stuart Dallas (Brentford) right footed shot from the left side of the box is saved in the top left corner. Assisted by Alex Pritchard. Corner, Brentford. Conceded by Richard Smallwood.